Week One got off to a great start for Major League Rugby. Each game was decided by less than five points. This week three teams have a bye week and the Utah Warriors play their first match of the season. There will be no CBS Sports Network game of the week due to the Super Bowl. The Utah Warriors head to Texas to for their first match of the 2019 Major League Rugby season. The Warriors will have to find a way to replace Paul Lasike and Kurt Morath who both left for overseas contracts. Utah didn't make a splash signing this offseason, instead they spread that money around a number of quality players. Coach Alf Daniels has brought in new coaches. And he implemented a new strength and conditioning program. We'll see if it makes any difference as the Warriors ran out of gas multiple times last season. The Austin Elite lost to the Houston SaberCats last week on a last minute penalty goal from Sam Windsor. One strength the Elite can take away from that match, is they held the SaberCats out of the try zone. The bad side, they gave up seven penalty kicks. Austin's scrum eventually settled down last week and they'll look to make it their strong point this week. Expect the Elite to come out firing as they look for their first win of the season. The Glendale Raptors are coming off a frustrating match against Seattle. They controlled most of the match, but they had ball handling issues all game that cost them in the end. This week the Raptors will look to hang onto the ball this week in New Orleans. The Raptors will be without a number of Eagles for the next couple of weeks, but they made some depth signings this weekend that will help them out. Look for Glendale to play angry against the Gold. 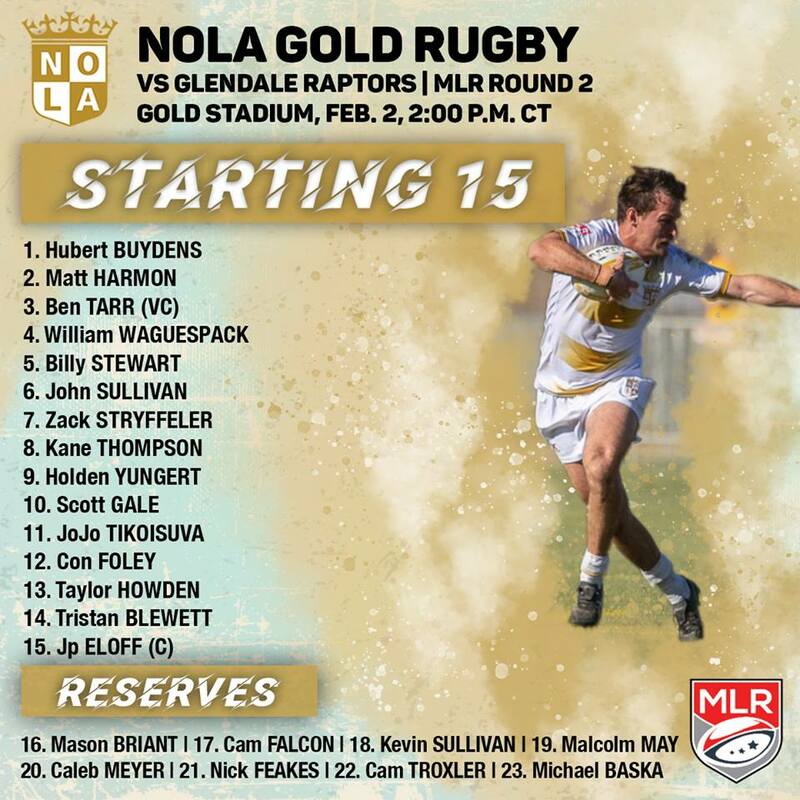 The NOLA Gold raced out to a first half bonus point against the Toronto Arrows last week and held on for the win in the end. This week they'll have to contend with the focused Glendale Raptors. Con Foley, Scott Gale, and Tristan Blewett were big offseason signings for the Gold and they showed what they could bring last week. The Gold looked to have improved their offensive and defensive systems from last year. Expect the Gold to not go down without a fight. The Legion struggled at times and looked great at times against Rugby United New York last week. Joe Pietersen has been a great signing for the Legion. He made that team run against RUNY. One criticism of the Legion is they played flat and lost meters during their passing. San Diego needs to fix that in order to have a chance against the defending champs. The Legion's scrum looked a lot better against RUNY then they did last season. If San Diego can show continuous improvement, they'll be a team to watch in MLR.